Where do I use my Memory Foam Warehouse voucher code? 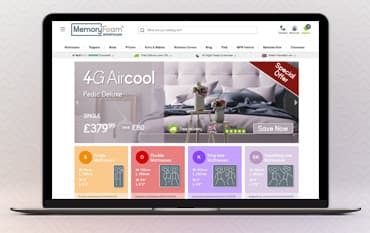 Find a coupon code you would like to use, click it, copy the code and follow our link to The Memory Foam Warehouse website. Find the mattress or bed you would like to buy and click 'Add to Cart'. When you are ready to checkout click on the 'Basket' link in the top-right of the screen. Underneath your order summary, look for the 'coupon codes' section, pop your code in the box and press 'Apply'. Your order will be updated with your discount. Click 'Proceed to checkout' to continue with your order details, payment and delivery options. The Memory Foam Warehouse provides you with great comfort and support with pillows and mattresses that are sure to guarantee great blissful moments of sleep. Along with providing beddings in every size, a wide selection of bed accessories is also available. The Memory Foam Warehouse specialise in super-comfortable memory foam mattresses and mattresses of all other types too, as well as toppers, pillows, beds, and even kids beds. Memory Foam Warehouse was founded in 2001 and is now one of the top UK manufacturers and suppliers of memory foam mattresses, toppers, and pillows. Their headquarters are based in Wakefield, which also where the company manufactures their memory foam mattresses and other products. They use foam for their mattresses that are also manufactured in the UK and is totally compliant with all of the relevant regulations. They submit their mattresses for testing to an independent UK test house on a regular basis. They are so confident with their products that they offer a no obligation free 60 night trial on all of their mattresses. Deliveries are Monday to Friday between 8 am and 9 pm. Find more Delivery information right here. If you wish to make a return, you must do so within 30 days of receiving your order. You will be responsible for the cost of the return. Items must be in their original condition and unused. Find more Return Policy Information in the Terms and Conditions section of Memory Foam Warehouse website. Memory Foam mattresses remember the shape of your body and moulds around it for maximum support and comfort. Use our Memory Foam Warehouse Discount Codes to save money on a massive range of memory foam mattresses, pillows and mattress overlays. Memory Foam mattresses help prevent sleep deprivation and back pain by providing a comfortable sleeping position keeping your spine in perfect alignment and eliminating pressure points, whatever position you sleep in.